Bradley L. Loeb, O.D., is originally from Hamburg, Pennsylvania. He is a graduate of Susquehanna University and the New England College of Optometry in Boston, Massachusetts. 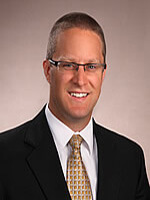 Dr. Loeb enjoys all aspects of optometry including Pediatrics, Primary Care and contact lens fittings and management. He performs diabetic eye exams and glaucoma screenings and management. Dr. Loeb manages eye emergencies including foreign bodies, pink eye and new onset flashes and floaters. Dr. Loeb resides in Wyomissing with his wife, Natalie, and their four daughters, Kylee, Alexis, Bailey and Addison. He and his family enjoy water skiing, basketball and family bike rides.